US Secretary of State John Kerry speaks during a press conference at the Ala Archa compound on Saturday Oct. 31, 2015, in Bishkek. Kerry arrived in Central Asia for a five-day, five-nation tour of the "Stans", Kyrgyzstan, Uzbekistan, Kazakhstan, Tajikistan and Turkmenistan, to reassure them, that they will not be forgotten. U.S. Secretary of State John Kerry met with some of the world's most repressive governments Sunday, hoping to deepen America's economic and security ties in Central Asia despite the often poor respect for human rights across the strategic region. A day after visiting the area's only parliamentary democracy, Kerry engaged in a difficult balancing act. The countries he spoke with included two still ruled by the only presidents they've ever known and another whose leader has been in power more than two decades. But given their geography just north of unstable Afghanistan, and squeezed by the political influence of Russia and commercial dominance of China, the United States has an interest in maintaining and cultivating even stronger ties. 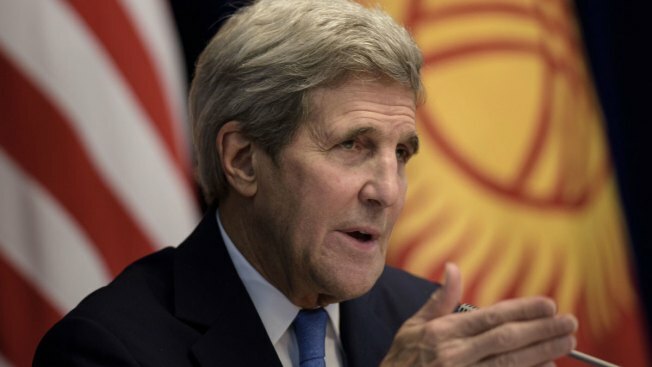 "In Central Asia as elsewhere, people have a deep hunger for governments that are accountable and effective," Kerry told the foreign ministers of Kazakhstan, Kyrgyzstan, Tajikistan, Turkmenistan and Uzbekistan. The agenda for the six-nation talks was far broader, however, promoting greater commercial activity among the five former Soviet republics and increased security cooperation to counter the Islamic State's activities. No one else mentioned human rights or democracy, but Kerry said economic projects are "closely related to the quality of governance and the strength of democratic institutions." Arriving in the ancient Silk Road city of Samarkand, Kerry was greeted at the airport by President Islam Karimov of Uzbekistan, whose rights record is routinely described as atrocious. In its annual human rights report, the State Department lambasted Karimov's government for torturing detainees, rigging elections, imposing widespread religious restrictions and imprisoning people of all faiths. Human rights groups say forced labor remains pervasive in the country's cotton fields and that thousands have been convicted of "extremism" in closed trials after confessions obtained through torture. Corruption reigns with impunity. Karimov and Kerry didn't take any questions when a small group of journalists was briefly permitted into their meeting at a presidential residence. The larger meeting took place after. The human rights situation appears little better among Uzbekistan's neighbors. The State Department says Kazakhstan's citizens lack free speech, press, assembly and religion, while groups such as Human Rights Watch say the authorities regularly jail peaceful protesters and fine and detain worshippers of religions outside of state control. Other reported abuses included unlawful killings. Tajikistan is an "authoritarian state," according to Kerry's agency. Authorities there recently banned the opposition Islamic Renaissance Party and arrested 78 of its members. Even their lawyer was arrested, while a former presidential candidate is serving a 29-year prison term. In March, assailants shot and killed a Tajik opposition figure in Istanbul under mysterious circumstances. Ahead of Kerry's trip, a U.S. official noted that Tajikistan cracks down on men with long beards. Turkmenistan, meanwhile, is one of the world's most closed societies. Few human rights monitors exist in the country. Rights groups on the outside say it is impossible to determine how many political prisoners the government is holding, while some have simply disappeared in prisons, cut off from contact with their families and the outside world. The State Department cites a litany of abuses including arbitrary arrest, torture, lack of privacy and human trafficking, while noting that no government officials have been prosecuted for human rights infractions. Kerry visited the lone, democratic bright spot in the region on Saturday: Kyrgyzstan. There, he praised recent parliamentary elections and expressed regret for the State Department's awarding of its annual Human Rights Award to an ethnic Uzbek activist serving a life sentence in prison for stirring up "ethnic hatred." The honor was meant to reflect Azimzhan Askarov's life work, Kerry stressed, and not designed to offend the Kyrgyz government. It responded in July by lambasting the U.S. and dissolving a 22-year-old cooperation agreement with the United States. Kerry noted that a new agreement was now needed. But even Kyrgyzstan wasn't beyond the State Department's criticism this year. The report cited a continued denial of justice after ethnic violence in the country's south in 2010, poor judiciary procedures, torture of prisoners and "systematic, police-driven extortion of vulnerable minority groups." In a letter to Kerry ahead of his trip, Sen. Ben Cardin of Maryland, the Senate Foreign Relations Committee's top Democrat, highlighted the issue of political prisoners and cited an "erosion of the democratic process and respect for human rights across Central Asia." Cardin said Uzbekistan may be holding thousands of such prisoners alone, but he listed opposition figures in each land who are jailed on charges ranging from illegal entry into the country, polygamy and violation of internal prison rules to questionable claims of corruption, hostage taking, terrorism and murder.